It seems like every car in my day care’s parking lot has those stick figure decals in the back window telling you just how many children, cats, and dogs the family has, occasionally along with a soccer ball or tutu. But not one of them has the decals Kelly Kreations sells on Etsy. I wish they would–it would be like a pre-screen for new parent-friends! They’re also (unfortunately) clearly intellectual property violations, but a clever variation on a tired suburban cliche. 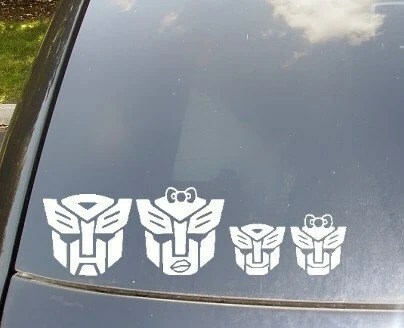 Maybe you’re more of an Autobot family. Or perhaps you’re growing your own army of tiny Stormtroopers. With bows! I love that the kids in the AT-AT family are AT-STs. She also has Mario, Star Trek, and GI Joe themed decals. I have AT-AT / AT-ST decals on the back of my car. Alas, the Etsy store I bought them from has disappeared. Love them, right now we have 2 large Apple decals and 2 small Apple decals for our Mac crazed family! Where did you get the apple stickers? Did they come with the Macs (I didn’t realize they came in different sizes). Yes, if you can, would you let me know where you got those as well? It would be a perfect Christmas gift for my brother’s family! Thanks for sharing this!! We ordered our set today to turn my mommy-mobile into a geek-mobile. Can’t wait!! I will freely admit I have those stick figures. But mine are geeked out. I’m in a lab coat holding a beaker, and my son is proudly displaying a laptop.